Day 1: Arrivals at Cairo airport meet & assist by our representative through customs to the hotel overnight. Day 2: Breakfast. Our Egyptologist will take you to the Egyptian Museum, hydrotherapy treatments at spa & opportunity to buy the original Lotus perfumes, which was dressed by the ancient Egyptian. Day 3: Long session meditation in the great pyramid, 2nd massage at spa with hydrotherapy treatments. 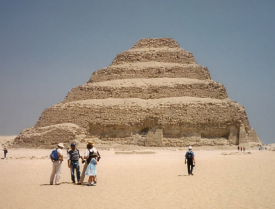 Day 4: Our Egyptologist will take you to Sakkara (Meditation session), and Memphis, capital of the ancient kingdom, one of ancient Egypt’s most important cities. Then continue to Sakkara. Day 5: Breakfast, Start your Tour at Mohammed Ali mosque (Citadel Mosque), El-Refaay Mosque, and El-Sultan Hassan Mosque. Then psycho - aromatherapy massage of spa. Day 6: Breakfast, Start your Tour at Coptic area including Coptic churches with some meditation session, free at leisure. Day 7: Free at leisure, or shopping day. Day 8: Transfer to Cairo airport for final departure.